Often we don’t realize how our lives can be changed so much by just a few revelations. One revelation I had as a young girl was just how much the present depends on history. If certain people didn’t do certain things in the past, we would not be who we are today. This is just as true in our individual lives as it is in to the world in general. One man who shaped the course of history in medicine is Nicholas Culpeper. Nicholas Culpeper’s life started with tragedy. He was born just 13 days after his father died, and being that his father left no official heirs when he died, all of this titles and lands were given over to other men. As such, Culpeper was raised by his mother and her family in Isfield, Sussex. His grandfather was one of his biggest influences in his early days. As a child, Culpeper was fascinated by the stars and by his grandfather’s clock collection. His grandfather taught him Greek and Latin, as well as introduced him to the works of Ptolemy. Which all helped feed his growing interest in Astronomy. But it was his grandmother who introduced him to the medicinal use of plants. At the age of 16, Culpeper was sent to Cambridge University. Since his father and grandfather were both ministers, his family had decided to send him to study theology and become a minister himself. Culpeper, however, had other ideas. He never really took his theological studies seriously, instead studying anatomy and the medicinal uses of herbs. He also spent quite a bit of his time in taverns and playing games. He even picked up the newest trend of smoking. However, he never did finish his Cambridge education. He had secretly planned to elope with the heiress Judith Rivers. He had known her from childhood and they knew that their families would not consent to the marriage. Sadly, her coach was struck by lightning on the way to their rendezvous. Culpeper was overcome with grief and sorrow by the news. This caused him to leave University, and the news of both the affair and his leaving University caused his grandfather to disinherit him. He had also burnt his bridges at Cambridge, so any hopes of completing his education to be a minister were dashed, as well as any hope to go back to University to study medicine. His grandfather suggested that he become an apothecary. 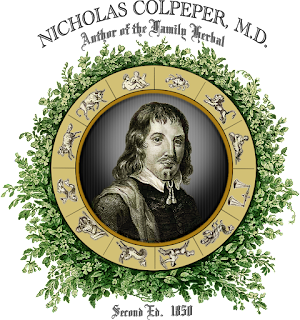 Culpeper was taken on as an apprentice to the apothecary Francis Drake, in London. In return, Culpeper taught Drake Latin. During his training, he studied the same book that his grandmother had introduced him to in his youth, Gerard’s Herbal. He even got to learn from Thomas Jefferson who was an assistant of the Apothecary Society and was editing the recently expanded Herbal. Culpeper became extremely proficient with the herbs found in the Herbal, as well as quite a few other herbs. So proficient that he took over the apothecary business when Drake died. 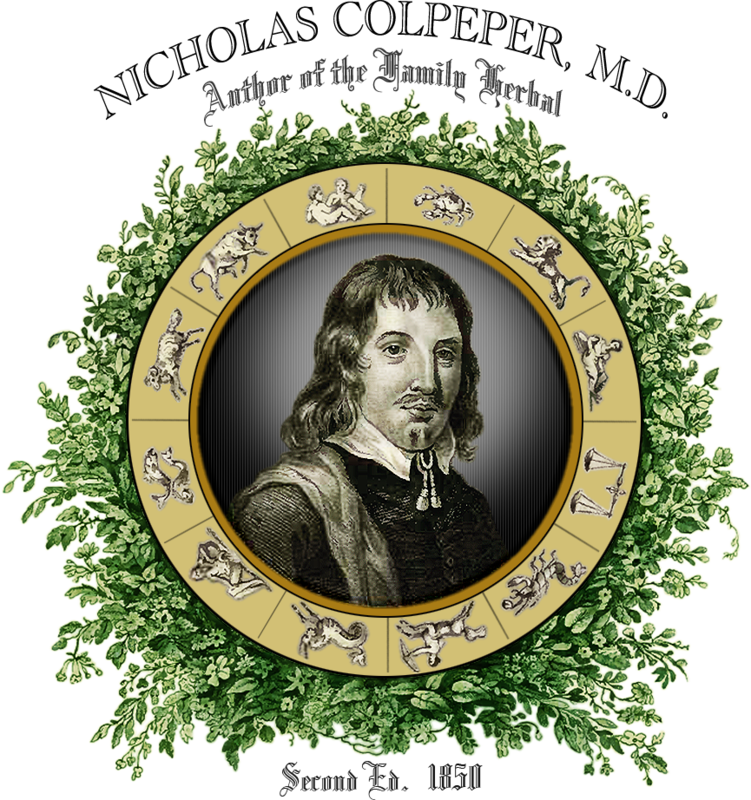 Culpeper’s move to London was beneficial, not only to his herbal and medical knowledge, but also to his astrological knowledge. Culpeper studied with William Lilly, an astronomer in London, who urged him to pay attention to the planetary influences on his patients in order to regulate their prescriptions. Culpeper became increasingly influenced by astrology and studied as much as he could. His classical training in Greek and Latin was of a large help in this as most of the astrological texts were written in these languages. During his studies, he developed what was to become his life-long mission. He wanted to put natural medicine and medical knowledge back into the hands of the people. All of the people, not just the nobility and scholars. To this end he translated a few of the great medical texts into English, wrote a few books, and was labeled a quack and charlatan by many of the physicians of his day. Despite all of the negative press, Culpeper was a well-known and very successful herbalist. He has written a great number of books, and translated even more. A Complete Herbal has even been continually in print since he originally wrote it. One of the ideas he is most well-known for in the herbal community is the correlation of astronomy to the plants and to the human body. He believed that the plants are able to channel and use the influence and energy of the planets. The plants could then be used as food and medicine and give us those energies in our consumption of them. Culpeper required his students (and asked his readers) to study the symbolism associated with each herb’s planet and use that to correctly administer the herb itself. An herb associated with the sun, being warming and strengthening to the vital force (life force), would be used to strengthen a weakness. The sign/constellation Taurus is associated with the throat, so an herb under that sign would be used for issues concerning the throat. He also taught many other uses for astronomy in medicine, such as the appropriate times to plant and harvest the plants based on their heavenly associations. glimpse into the world of medicine in the 17th century. We can also draw several parallels to some of our philosophies today. Thank you Nicholas Culpeper for pioneering the way for natural medicine to come back into the hands of the people. And thank you all for reading this brief footnote in the life of an amazing historical figure.